J Harlen Bretz (1882-1981) was a high-school biology teacher in Seattle, who developed an interest in the glacial geology of the Puget Sound. 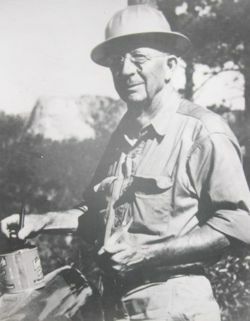 He received a Ph.D. in Geology from the University of Chicago in 1913. He then accepted a position as an assistant professor of geology at the University of Washington and later at the University of Chicago. Bretz is best known for proposing the theory that the Channeled Scablands of eastern Washington were formed by catastrophic flooding. Bretz began his field research in the Channeled Scablands during the summer of 1922, and it quickly became clear to him that neither glaciation nor ordinary stream erosion could explain the Scabland features. The next year, he published a paper in which he suggested that it would have taken a massive volume of water to create the degree of channel erosion that had occurred. The suggestion of a catastrophic flood put forth by Bretz caused him to become an outcast in the geological community. The idea that sites, such as Dry Falls and the Grand Coulee, were the result of floods was thought to be outrageous, and described by some as near lunacy. This sentiment was largely due to the uniformitarianism bias that has been pervasive among geologists since the 19th century rejection of Biblical catastrophism. Commemorative plaque for Harlen Bretz outside the Dry Falls visitor center, located in the Channeled Scablands of eastern Washington State. It took many decades for Harlen Bretz to finally receive the credit he deserved. In fact, it was not until the area was observed from the air that many of the Channeled Scabland's features were accepted as flood deposits (such as the giant ripple marks, which are up to 30 feet high and 250 feet apart). Almost fifty years following his original proposal, Bretz was hailed as a hero, and in 1979, at the age of 96, he was given geology's highest honor — the Penrose Medal, which rewards one researcher each year for exceptional contributions to geology. The Dry Falls visitor center has been dedicated to Harlen Bretz where the plaque at right can be found displayed. It is now commonly known that this area of eastern Washington was destroyed by a massive flood catastrophe called the Missoula flood. The flood was caused when a large glacial lake (lake Missoula) broke through its natural dam and destroyed a great portion of the Northwest USA. During the Missoula flood stratified layers of deposits and deep extensive canyons were formed rapidly. Such features are common to our world and geologists are simply quick to interpret them as the result of slow and gradual processes because they cannot accept that the Biblical global flood was responsible. This page was last modified on 8 June 2010, at 14:48.